These free wedding labels can be printed right from your home computer and then used to top your wedding favor boxes, adorn your envelopes, personalize a wine or water bottle, label a jar, or stuck to just about anything else you'd want to label. It's easy to personalize these free wedding favors so you can add your own custom details to them like the wedding date or the bride's and groom's names. You can also use wedding favor tags in place of the labels or even printed out on label paper if you'd rather. You can even go wild and use both. The wedding labels work best when printed on label paper and then you can quickly peel and stick them on just about anything. You can print them on cardstock or computer paper and then use tape or glue to adhere them. You can find other free wedding templates so you can create your own place cards or menus. There are more wedding freebies available for everything from free catalogs to invitation samples. 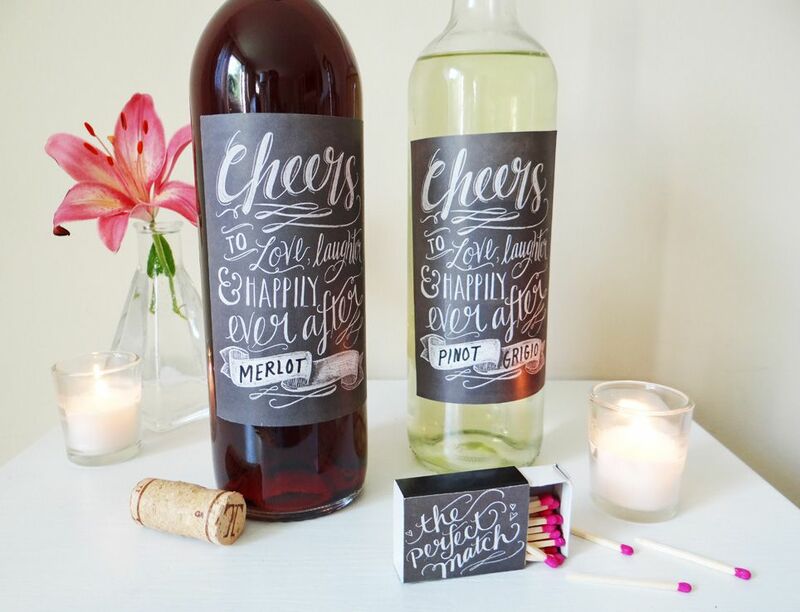 If you plan on giving a bottle of wine out as wedding favors, or you are simply just serving wine at your reception, these free wine bottle labels will be perfect. These wine bottle labels can all be personalized with just about anything you want from a monogram or even table numbers. They also make great gifts for other times of the year. If you're looking for wedding labels to stick on water bottles, these ones over at Wedding Bee look great. You can download them in a word processing program like Word or Google Docs and then customize them with the names of the bride and groom. All of those wedding invitations, thank you notes, and save the date cards will need to have an address label on them. You will have to pay for a stamp but there's no reason you need to pay for an address label. This group of free address label templates can be customized with the return and recipient address so you'll just need to print and stick them on the envelopes. Here are some free, printable monogram labels in a cute chalkboard style. They can be personalized with your initials before printing. These go with any wedding theme and can be stuck on anything from favor boxes to the back of invitation envelopes. 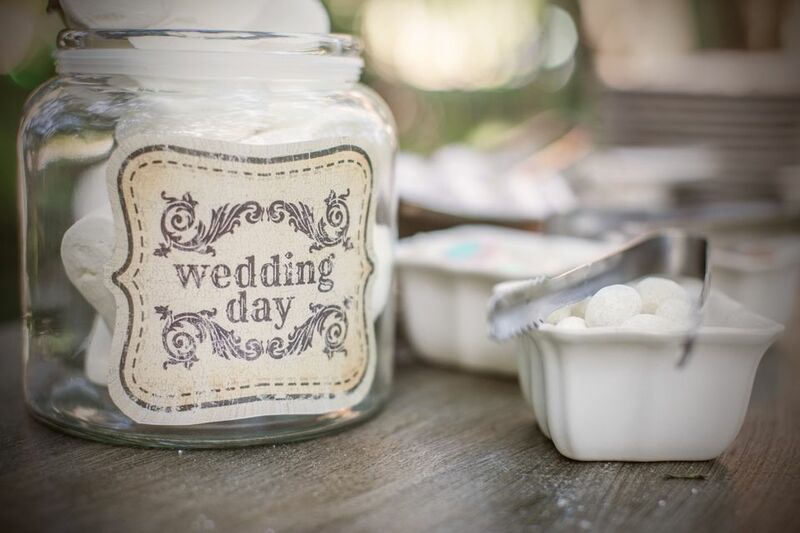 Using canning jars for wedding favors is a big trend right now and these canning jar labels will have them looking great. There are several designs to choose from whether you are giving your guests a homemade treat or putting your favors in a stylish container. If you'd like to incorporate some vintage elements into your wedding, these free vintage labels will help you do just that. They'll look great as part of your decorations, on your wedding favors, incorporated with your flowers, or anywhere in between. Something Turquoise has designed these free wedding labels that can be stuck to stick chapsticks or lip balm tins. They say "Our Love Is the Balm" "Handmade Lip Balm" and they make perfect guest or wedding party favors. There's even a free lip balm recipe so you can make your own if you'd like. Something Turquoise has designed these adorable hot sauce bottle labels that say "Thank You for Spicing Up Our Special Day". These make great favors that anyone and any age are sure to love. There's a hot sauce recipe included so you can make your own hot suace if you like. Tic Tacs are a great wedding favor and they look so good dressed up with these wedding labels from Something Turquoise. The labels say "Mint To Be" with a heart with an arrow through it. You can print them in whatever color you'd like. Print these labels out on label paper and it's as easy as peeling and sticking them to the top and sides of the Tic-Tac container. Swell & Grand has designed some unique wedding labels for that wrap around small bottles of whiskey that your guests can take home as a favor. The free, printable labels have the couple's names and date of the wedding, which can be customized before printing. The vintage rose wedding labels are truly something special and may be the perfect addition to your wedding. These beautifully designed wedding label templates include those for a favor, jar, wine bottle, address, envelope wrap, large round, and a candle.